As you can see by the first magazine, the October issue of Better Homes and Gardens, I am a little behind on my reading. I have been fighting an infection for weeks and I am a little behind on everything! 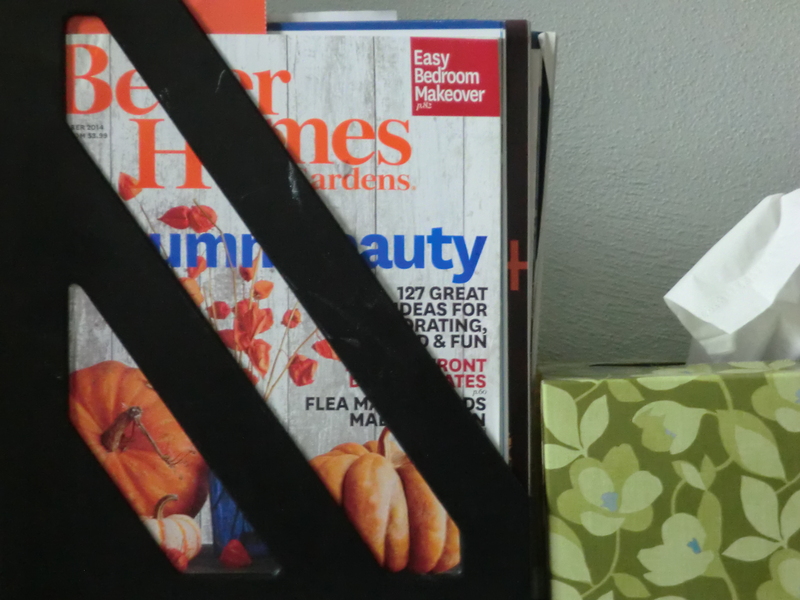 I keep my magazines in a rack in the bathroom. When new ones arrive I put them in the back of the magazine rack. Over the last year I realized I didn’t have time to read all of them each month. I am letting two subscriptions expire. I am saving money by only ordering the ones I have time to read and I am storing none of them. The best magazine storage is to pass them on. I made a deal with my mom because we were buying the same magazines and sharing them when we finished. I am paying the subscription for one of the duplicates and she is paying for the second. I save money by purchasing only the magazines I have time to read and sharing them with my mom. This entry was posted in Give It Away, Money Saving Ideas, Organizing and tagged Giving, Money Saving Ideas, Organizing by Frugal Fish. Bookmark the permalink.